Take the Massachusetts Turnpike to Exit 2 (Lee exit). From the ramp, turn right onto Route 20, following Route 20 west through the town of Lee. Entering Lenox, just beyond Cranwell Resort (on the right), get into the left turn lane at the second stop light. Turn left onto Walker Street, which is Route 183 south. 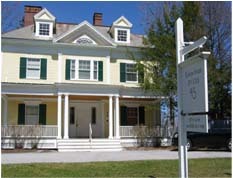 Go almost 1 mile, passing on the right the Gables Inn, the Lenox Community Center, and the Gateways Inn. Number 45 Walker Street, Bishop House Offices, is a large yellow house on the right next door to the Gateways Inn. Parking is in front of the building. Handicap access is available from the back driveway. Parking for the handicap access is in the back of the building. Take a right on Church Street, then turn into the first drive way behind the house on the corner. Go through the parking lot for the corner house and park in the back parking lot of 45 Walker Street, Bishop House Offices. The handicap ramp is to the left of the back door. Take Route 7 south. Turn right onto Walker Street, which is Route 183 south, and follow the directions above from that point. Take Route 7 north through Stockbridge into Lenox. In Lenox, Route 7 north merges with Route 20 west. Follow Routes 7 and 20 to Walker Street, which is Route 183 south, and follow the directions above from that point.